Cream together the butter, sugar, and vanilla until light and fluffy. Add one egg and half of the flour, and beat well until combined. Add the remaining eggs and flour, and beat until combined. Pour the batter into the prepared pan and spread out evenly. Bake for 25 - 30 minutes, or until a toothpick inserted into the centre comes out clean. Allow the cake to cool in the pan for 5 minutes before turning it out onto a wire rack to cool completely. Add the chocolate, butter, and milk to a microwave-safe bowl, and heat in 30 second intervals, stirring after each one, until melted and smooth. Whisk in the icing sugar, cocoa powder, and boiling water until smooth and combined. Cut the cake into 16 bars. 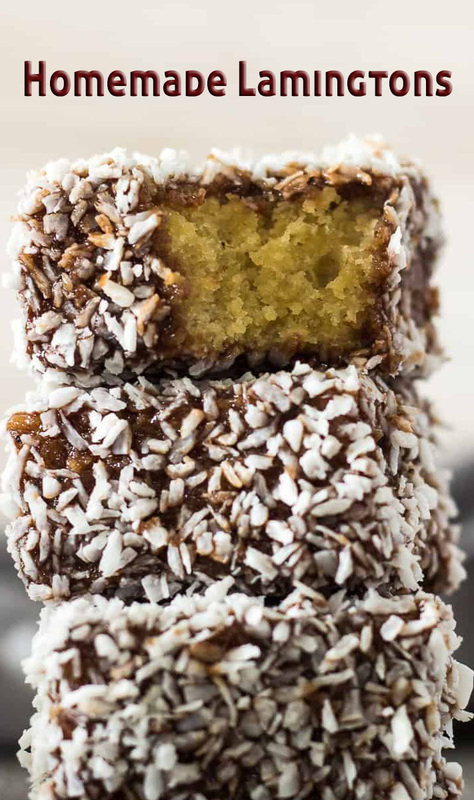 Gently dip a cake bar into the chocolate icing, making sure all sides are fully coated, then dip into the coconut. Transfer to a baking tray lined with parchment paper, and repeat with the remaining cakes. Allow the cakes to set at room temperature or in the fridge before serving.